NSW Fair Trading promotes a fair marketplace for consumers and traders by maximising traders' compliance with regulatory requirements. We safeguard consumer rights and investigate alleged breaches of the legislation we administer. In doing so, Fair Trading also seeks to educate and engage with both consumers and traders on issues that affect their rights and obligations. As a regulator, the main concern is to minimise any direct financial or material harm or detriment to a consumer from a business that fails to comply with the law. Our compliance efforts include a commitment to working with businesses and educating industry groups and other Government agencies to promote voluntary compliance. Proactive inspection programs are an effective way of achieving this important goal. Prevention is better than cure. We make comprehensive use of educational campaigns to inform consumers and businesses of their rights and obligations under the law. We seek to ensure that is as easy as possible for consumers and traders to understand and comply with their rights and obligations. We consider that consumers are best served by a competitive marketplace in which businesses compete fairly, in compliance with the law. We strive to ensure that customers are informed and not susceptible to misrepresentation. We also consider that most businesses want to treat their customers fairly and comply with the law. With our help we hope to make it easier to stay in business for traders in NSW. Fair Trading has a range of compliance and enforcement options available to achieve compliance with the law and enhance consumer protection. Fair Trading allocates resources where we can best address non-compliant conduct with the greatest benefit to individuals and the community. While all complaints are considered, we exercise a risk based approach when determining allocation of resources and the action to be taken. There are some forms of conduct that are so serious and detrimental to consumers (such as significant trust account fraud) that Fair Trading addresses them as a priority. Fair Trading will also prioritise the assessment of product safety issues which have the potential to cause harm, or even death. Where possible we aim to give the business or trader concerned a reasonable opportunity to respond, and provide a general summary of the actions we propose to take. However, in some instances it may be in the public interest to act promptly, without giving the trader or business prior warning. A major reason why we undertake targeted compliance and enforcement action is to achieve outcomes that deter other businesses from engaging in similar unacceptable behaviour. Publicising the outcomes of our compliance and enforcement actions has a positive deterrent effect. 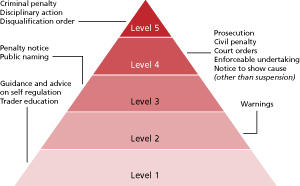 Our approach to compliance and enforcement remedies is summarised in the compliance pyramid below. The national Compliance and Dispute Resolution Advisory Committee (CDRAC) ensures that compliance and dispute resolution across Australia is coordinated, efficient, responsive, and where appropriate, consistently applied. CDRAC is currently Chaired by the Commissioner for NSW Fair Trading. NSW plays a significant leadership role in the coordination of dispute resolution, compliance and enforcement matters at a national level.